What is the difference between Aims and Outcomes? Aims tend to focus more on the intended results of teaching (what the teacher does), outcomes tend to focus more on the intended results of leaning (what the student does). Aims describe what the teacher intends to achieve, outcomes state what it is that the learner should achieve. Course Learning Outcomes are statements that describe the knowledge and aptitudes that students will have achieved and can reliably demonstrate upon successful completion of the course. Course Learning Outcomes should give students a clear idea of the knowledge and aptitudes that they are expected to develop during their course. 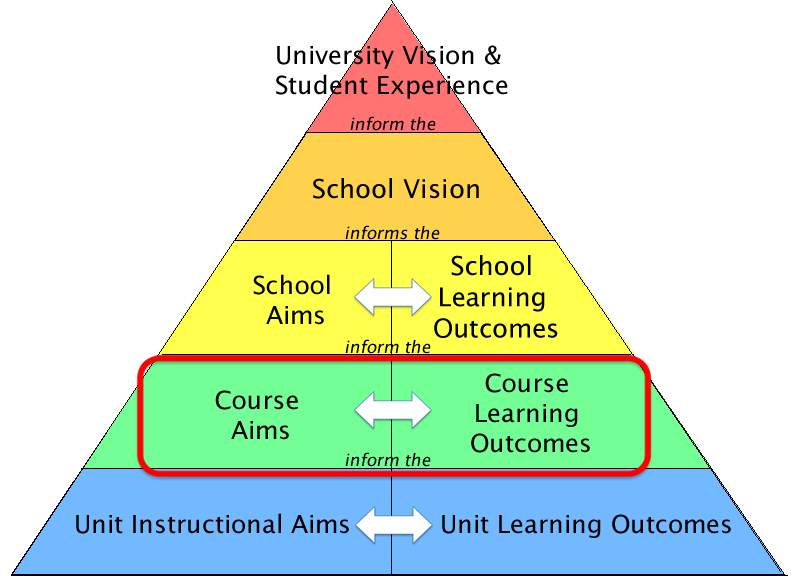 Course Aims should should be aligned with and informed by the School Aims, and provide a framework that can be used to inform the more detailed and specific aims of each Unit of the course.